Every Windows OS user is aware about the 'Send To' context menu option. You can use it to send any file to desktop as shortcut, compressed zip folder or to my documents folder. But you can make the menu more useful by making few very easy changes that are really simple to do. Many times you might have tried to open some unknown files, XML documents with Notepad. Also you may have installed multiple softwares for opening same type of file, like Adobe Reader and FoxIt reader for PDF files. By editing 'Send To' menu you can add shortcut of most used softwares and places like your favorite folder. Once done, if your default PDF reader is Adobe and you want to view any PDF file with Foxit reader, you just click on the PDF file and select 'Foxit Reader' from 'Send To' the menu and the file will open with respective software. Same is the case with Notepad. By using the same method you can add the Cloud folders of your favorite cloud services like Google Drive, Microsoft SkyDrive and Dropbox to the Send To menu and easily send any file directly to the Cloud without opening and navigating to the particular place. 1. Enter a command "shell:sendto" in Run ( Windows button + R) box without quotes. 2. A 'Send To' folder location window will open. You have to just paste a 'shortcut' of any software, folder location, cloud service into this folder and that location or software will start showing in the 'Send To' context menu option. 3. To create shortcut of any software right-click on that .exe file of that software in your C: program files folder and navigating to particular software. 4. Eg. 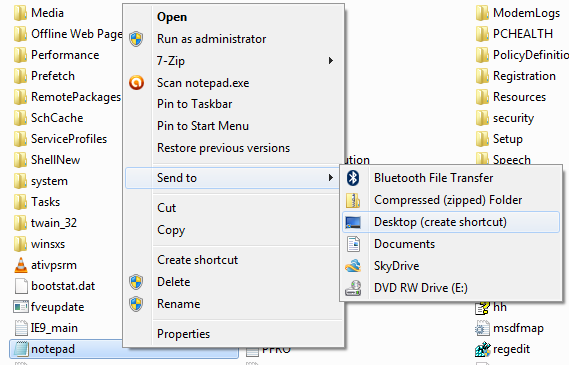 If you want to add 'notepad' to the send to menu, Notepad is located in the C:Windows folder. 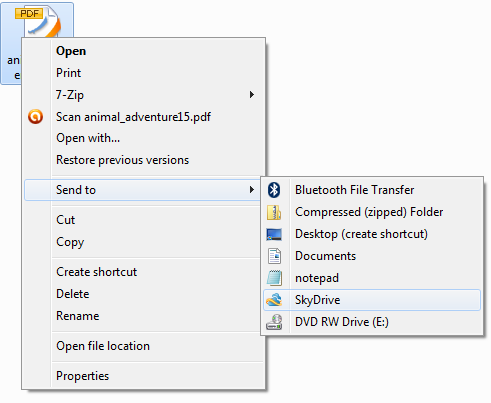 Right-click on the exe file in notepad and send it to 'Desktop (Create shortcut)'. This will create a shortcut for 'Notepad' on the Desktop. 5. Cut and paste that shortcut in 'Send To' folder and you are done. 6. The 'Notepad' option will start showing in 'Send To' context menu. 7. 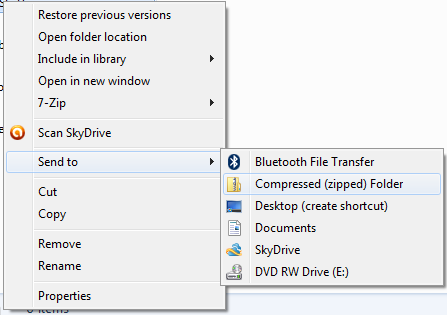 To add Google Drive, Dropbox or Microsoft SkyDrive to this option, instead of clicking on exe file, click on folder to create shortcut and then repeat all the steps. Right click on the original folder, send it to the desktop to create a shortcut and paste that shortcut in 'send to' menu. This way you can add or delete any number of softwares and locations to and from 'Send To' menu making it more productive and useful.